Bruyns, GJB.,& Hasdell, P. (2017). 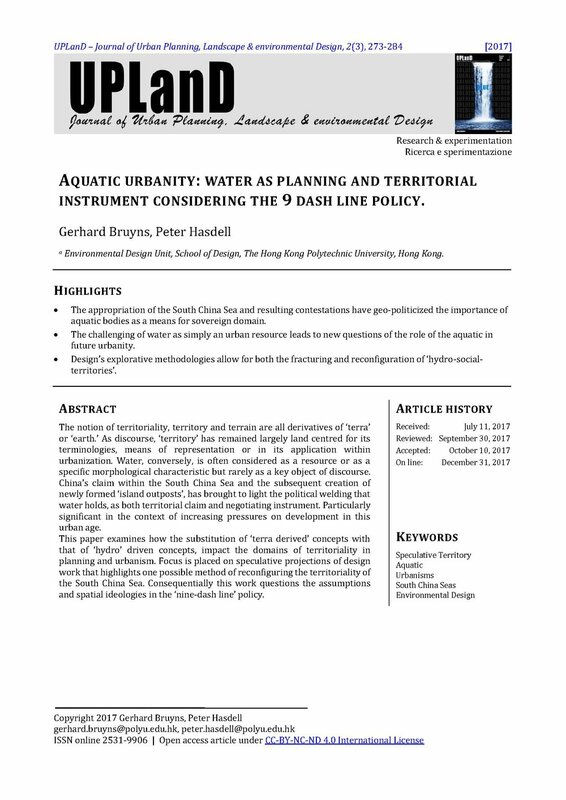 ‘Aquatic Urbanity: Water as Planning and Territorial Instrument Considering the 9 Dash Line Policy’. In: Upland–Journal of Urban Planning, Landscape & Environmental Design,1(1). ISSN 2531-9906, 2(2). Retrieved from http://www.upland.it/index.php/UPLanD/index. Bruyns, GJB., Elkin, D., & Hasdell, P. (2017). ‘Erasing Landscapes’. In: Urban Next, Journal #4, Photographic Atlas of Cities. ISSN 2575-5374. DOI: https://urbannext.net/erasing-landscapes/. Bruyns, GJB., Hasdell, P. (Forthcoming). ‘Doubling as strategy for territorial development; Bogota and Hong Kong’. Edited by C Pinilla. Bogota: National University of Colombia. Bruyns, GJB. & Tung, H., (Forthcoming). ‘Historical Lineage’. In: Hong Kong Interior Industry Guidelines for Interior Design. Edited by Horace Pan, et al. Hong Kong. Bruyns. GJB.,Low, IB., (2012). ‘Pondering (South) African Urban Development. Oppositions and correlations’. 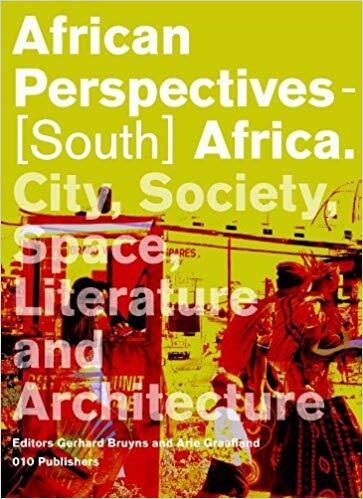 In: African Perspectives - South Africa: City, Society, Space and Architecture. Rotterdam: 010 Publishers. ISBN 978 90 6450 797 7. Peer reviewed. (With contributions from: Iain Low, Johan Legae, Arie Graafland, Gerhard Bruyns, Alta Steenkamp, MC Boyer, Edgar Pieterse and AbudMaliq Simone). Bruyns. GJB. (2012). ‘Perspectives From the Urban Edge; Pondering 10 Years of Urban Change’. In: African Perspectives - South Africa: City, Society, Space and Architecture.Rotterdam: 010 Publishers. Peer reviewed. Bruyns GJB. & Read. SA. (2008). ‘The Form of the Metropolitan Territory: The Case of Amsterdam And Its Periphery’. In: The Architecture Annual2006 -2007. Edited by H Bekkering, et al. Delft University of Technology. Rotterdam: 010 Publishers, pp. 70-75. ISBN 978-90-6450-653-6. Peer Reviewed. Bruyns, GJB. & Read, SA. (2006). ‘The Urban Machine’. In: SA Read & C Pinilla Castro (Eds.). Visualizing the invisible; towards an urban space.Amsterdam: Techne Press, pp. 52-67. Peer reviewed. Bruyns, GJB. (2007). ‘Models of Urban Structure revised: Static versus the dynamic ecological framework’. In: PermaCity,Edited by J H Rosemann, Delft: IFOU. ISBN 978-90-78658-05-4. Peer reviewed. Bruyns, GJB. (2006). ‘Bio-Urbanisms and The Problem of Form In Contemporary Urban Discourse’. In: PE Healy & GJB Bruyns (Eds.). 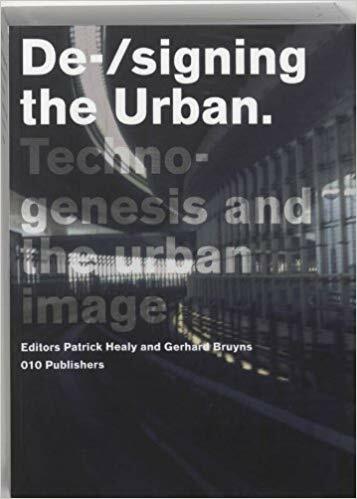 De-/signing the urban: Technogenesis and the urban image, Delft of School of Design Series on Architecture and Urbanism, Rotterdam: 010 Publishers, pp. 202-227. ISBN 90-6450-611-6. Peer reviewed. Bruyns, GJB.(2006). ‘Ubuntu: Post-Colonial Urban Tribe Space’. 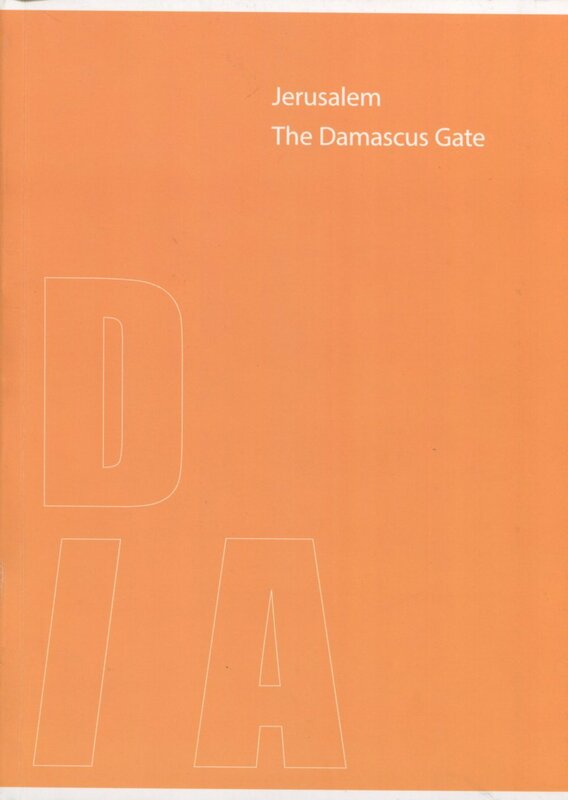 In: SA Read & C Pinilla Castro’s (Eds.). Visualizing the Invisible; Towards an Urban Space. Amsterdam: Techne Press, pp. 98-107. ISBN 90-8594-003-6, 13978-90-8594-003. Bruyns, GJB. (2006). ‘Urban Figures as Hypothesis of The Traditional, Contemporary, and Fluid Figures’. In: Hoeven, F. van der & Rosemann, HJ. (Eds.). 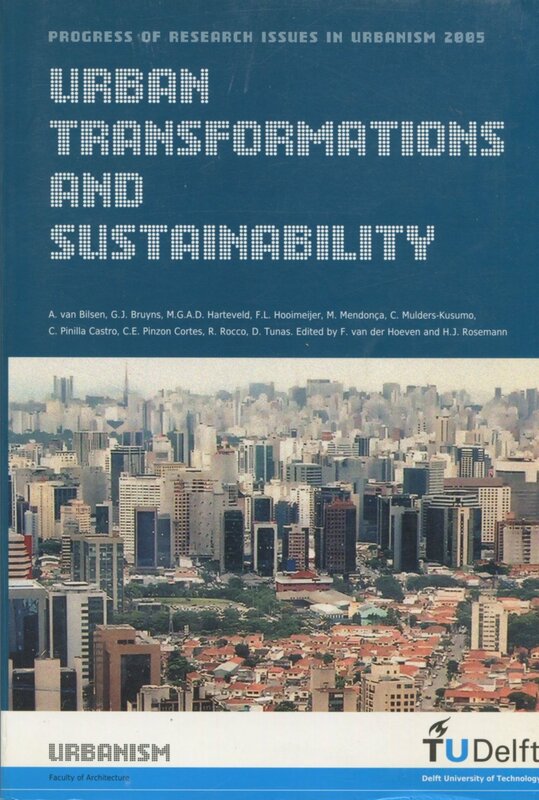 in Urban transformations and sustainability. Progress of Research Issues in Urbanism- 2005. Delft: IOS Press, pp. 21-31. Peer reviewed. Healy, P. (2019) ‘Art as Social Mechanism’. In: Bruyns, GJB. (Ed.) Design-Thinking Series, Hong Kong: The Cubic Research Network. Bruyns, GJB., Wirman, H. (2018). ‘Why the commons? Thinking design social, design economies and, design making’. PhD Winter School Document. Hong Kong. 978-988-16722-5-4. Graafland, AD, Bruyns, GJB& Jacoby, A. (2013). Jerusalem, The Damascus Gate. DIA MA Arch Studio, 2010 – 2011. DIA Architecture School, Anhalt University Department 3.
van Nes, A., Bruyns. GJB, Fuchs, A., Hoekstra, M., Mijer, H., (Eds). (2007). 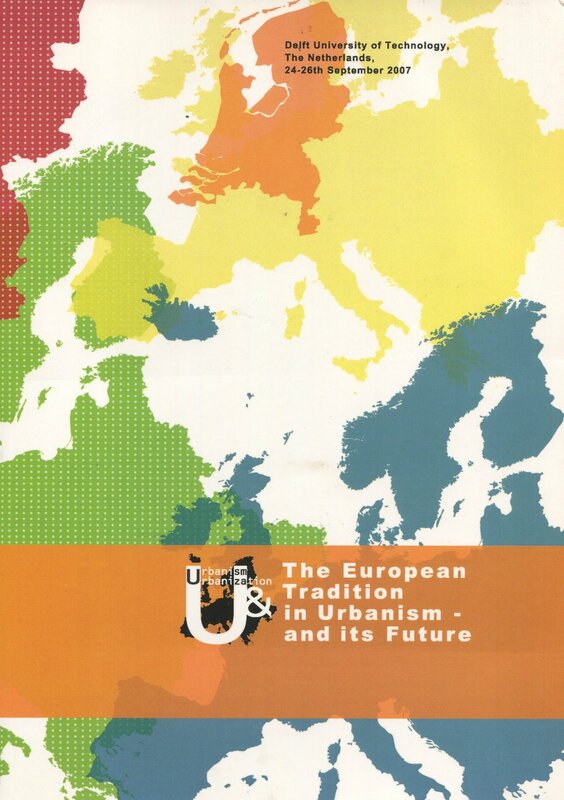 ‘The European Tradition in Urbanism, and its Future’. Conference Proceedings, Delft University of Technology. Delft: IFOU press. 978-90-78658-04-7. A. van Nes, C. Pinilla, Bruyns GJB, R. Rocco and Rosemann, J.H. (Eds). (2007). ‘The 5th City’, Publisher: Papirozifou, 2009, ISBN 9078658037. Bruyns, GJB. (2017). ‘Anthropomorphism and the Anthropocene Epoch’, in AM Post/Art Plus, March / April). Hong Kong. ISBN 9-771818-472006. Photographic Material - Healy, P. (2008). The Model and Its Architecture. Delft School of Design Series on Architecture and Urbanism. Rotterdam: 010 Publishers. ISBN 978-9064506840. Bruyns, GJB. (2018). ‘Model and the Lived, Three Dimensional Morphologies of Hong Kong’s Interior and Domestic Landscape’. Hong Kong Pavilion, Chengdu Creativity & Design Week 2018. Chengdu, China, 18 - 12 November 2018. Bruyns, GJB. (2018). ‘Square Foot Society, Compression as Liveability’. Hong Kong Pavilion, Chengdu Creativity & Design Week 2018. Chengdu, China, 18 - 12 November 2018. Bruyns, GJB., & et al. (2017). ‘Groundscapes’. Milan Salone Satellite Exhibition. Milan, Italy, 4-9 April 2017. Bruyns, GJB., & KO, K. (2016). ‘Tactical Urbanism and Hong Kong’s Occupy Central Movement’. From Re-Imagines Urbanism Exhibition, Urban Design Institute South Africa. Pretoria, South Africa, 13-15 June 2016. (Impact factor; 250 Visitors). This volume of the Delft School of Design series focuses on the South African urban context, seeking to construct a contemporary critical dialogue of current spatial practices in relation to social, political and governance structures. The contributors--academics, urban historians, architects, policy makers--reflect on the possible paths forward. The book is divided into thematic sections: "Other Urbanisms," "Tradition, Culture and Education," "Urban Design, Civic Action and Agency in South Africa" and "Future Perspectives." Editors: Patrick Healy & Gerhard Bruyns. This book represents the fruits of a year-long forum carried out in the Delft School of Design. Gathered from renowned visiting scholars, faculty members and doctoral candidates who contributed to workshops, seminars and lectures, the essays offer insight on urban processes and the aesthetic challenge for contemporary design in relation to image, technology and life sciences. Contributions include discussion on the structure of the network city; the virtual emergence and resilience of contemporary urban place in the context of Beijing; and a study of Nowa Huta, Poland. Editors: Stephen Read & Camilo Pinilla. The Urban Machine, in Visualizing the Invisible explores a possible nature of the contemporary urban, drawing on structuralist, post-structuralist and 'organic' philosophy (Whitehead, Gregory Bateson, Lefebvre, Foucault, Bergson, Deleuze, Latour, and others). It also looks at the city itself - in its origins as polis, in its spatial evolution, and in the hybridizing properties of network. With contributions from: Patrick Healy, Gerhard Bruyns, Deborah Hauptmann, Stephen Read, and John Law. The Social and the Spatial, Urban Models as Morphologies for a ‘Lived’ Approach to Planning. How and in what manner has the social been instrumental in formulating planning policies, and does Hong Kong ascribe to any social concept that facilitates its current spatial planning framework? The legacy of the social in planning originally came to fruition within the Chicago School of Social Sciences during the early 1920s. Since then, the understanding of the social and how planning responds to the social has been wide and varied. This paper examines the social’s application in spatial notions in addition to its context within Hong Kong. At its core this argument outlines the consequences of a social notion within planning and the spatial modes of recourse. Issues of scaling are brought into question when addressing planning as well as economic focus, in both the local as well as regional governance levels, which further emphasises the dynamic proxies of social and spatial factors for territorial planning. Having neither of these, the argument then highlights the realities of economic asymmetries in the disempowerment of a local populous through land speculation and housing shortages. Available at JapSam Books and Amazon. Contemporary commoning practices do not constitute a mere alternative, but instead comprise a qualitative threshold: a moment of critical differentiation. As such, they call out for the development of a set of renewed methodological, analytical and synthetic tools and devices that are better equipped to understand the in-between as a ‘thirding’: as a form of differentiated publicness. The editorial introduction offers a platform of negotiation, which far from disregarding the already established approaches to the thematic in question, aims at expanding their scope, complementing them with non-dialectical readings. 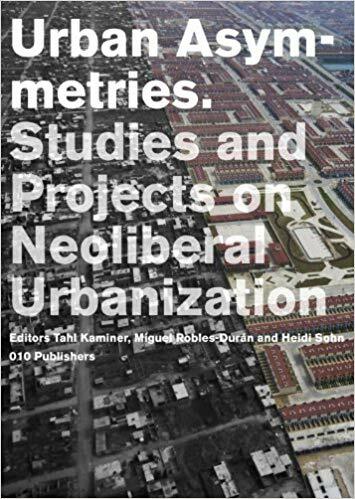 By presenting non-hierarchical understandings of urban practices, as well as fostering the intersection of different trajectories and discourses, the introduction to this issue strives to provide a fertile ground for the encounter of the multidimensional and relational potentials of contemporary commoning practices.